Batman Annual #1: Christmas in Gotham. Two days later, Alfred insisted on buying the dog at the pound. They wanted to euthanize a dog that broken and traumatized, but Pennyworth donated more than enough money to make them look the other way. The next day, Bruce Wayne is upset to see the dog in his home. He is far from pleased as he stares the animal down. Over the next few months, Alfred trains the dog while Bruce continues his never ending crusade against crime. The dog is aggressive and constantly fights against Alfred, and Bruce thinks the animal is a lost cause. Batman says that Alfred will never understand. Some wounds don’t heal. Undeterred Alfred orders the dog to sit… and it obeys. The next week, Batman stumbles into the cave, injured. Ace rushes to his side, worried, and Batman reassures the dog he is okay. On Christmas Day, Bruce gives Ace a mask of his own, figuring it might be a fun gag for Halloween. Besides, Ace makes for a great Bat-Hound. Bruce can’t help but notice he didn’t get a gift from Alfred. It’s okay, as Wayne has everything he could possibly want, but Alfred is mildly frustrated with this. He says he was a bit busy with the dog. As he goes to get Bruce breakfast, he can’t help but be a little amused. The World’s Greatest Detective couldn’t see the gift right in front of him. 8.5 million people live in this city, and that doesn’t even count commuters, tourists, and all sorts of other visitors. On average, the city gets five and a half emergency calls per second. It’s never quiet. There are no silent nights. Advanced programs within the Batcomputer process these calls and screen them for meaningful activity, filtering out the content to constantly update Batman on crises as they emerge across the city. It’s a monumental task, but someone has to do it. Batman spots an unusual gathering at Champion Square. Neutral territory to the gangs, this is one of the few spots in the city that maintains a natural balance of the peace. But today, a group is engaging in some strange acrobatics. With nobody recently escaping from Blackgate or Arkham, and all other usual suspects accounted for, Batman isn’t sure who this is. Then, the strangest thing happens… the system goes quiet. Batman checks in with Alfred, and he confirms it’s all working. There’s just nothing coming in. Perhaps it is just a moment of grace, a few minutes of peace. The acrobats finish their performance, refusing any money, as it was just a public display. Batman smiles a the sight, and the moment ends. A call comes in about some gun fire, and the Dark Knight heads out. Up on a housetop, Harley Quinn attempts to break into GCPD headquarters. Ever vigilant, Batman leaps in and grabs her. Forced into the Batmobile, Harley insists that she meant no harm. She was bringing candy and cookies to the cops in an attempt to make amends. Batman throws a pudding with the Joker’s face on it out the window and isn’t exactly convinced. Harley says that was just in case she ran into her ex, and, explosives aside, she really did have only good intentions. She points out things have changed. People look up to her now! Batman says he’s going to finish up his patrol and drop her off at city limits. 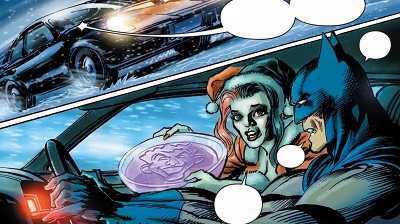 Harley decides to pass the time singing Christmas carols, much to Batman’s annoyance. However, something strange happens during patrol. The city is quiet. The citizens stand up to muggers and are looking out for each other. Batman finds he never even has to leave the car. He drops Harley off, and she is frustrated, assuming he has left her alone in the cold. However, she realizes he actually just drove her home. Harley meets up with her friends, and they agree to go carolling together. At Cherry Hill, a billionaire named Barry O’Neill has come by the city’s Winter Town, a special event celebrated every year. This man has been helping people since before Bruce was even born. Wayne’s mother always looked up to him, so Bruce is honoured to introduce him at this year’s event. However, the festivities are interrupted by Minister Blizzard. This strange villain attacked the ceremony, so Bruce runs off to get his gear. In one blow, Batman is able to knock the villain out. O’Neill is relieved, but saddened, as he wanted Winter Town to be the perfect event for the children of Gotham. On Christmas Eve, Batman detects a whiff of fear gas in the air. It’s not enough to force the city into chaos, but it is giving everyone a mild panic attack. Putting on a gas mask, Batman knows this is one of two things – a test by Scarecrow… or a distraction. In Arkham, a woman begins giving gifts to some of her fellow inmates. Her name is Haunter. With a simple DNA sample, she can kill anyone. And she has bad news for one of the Arkham guards – he left some hair on her bed. In the cold, Haunter is able to make her way out of Arkham and meet up with her friend the Scarecrow. However, their reunion is short lived when Batman bursts into the room. Haunter has been preparing this for years, and Batman collapses, but it’s all a ruse. Batman is very careful to protect his own DNA, and these two aren’t the only one who can work with samples. Now, he gives them two options, and asks them to consider them carefully. First, they can all pay a visit back to Arkham, or, second, Batman can leave them here, infected by his nerve toxin, and they can freeze to death. Now this was a fun request to get through Patreon! I wasn’t really sure what to expect out of this year’s Batman Annual. I didn’t look into this comic much beforehand, so I was really please to see a polished anthology comic featuring some of the best and brightest talents in the world of Batman. First up was Good Boy, script by Tom King, pencils and ink by David Finch. This one was excellent. I always have a weakness for dogs so naturally I’m going to like this story, and Finch’s art is always a treat. He does a good job at conveying certain nuances in the story and his art sells the story nicely. I like the sentiment behind it, and the ending a great deal. The idea of Alfred getting and training this dog as a gift, and that gift going unnoticed was cute and the story was fun. Ace the Bat-Hound, for those that didn’t know, used to be a real thing in Batman, so it’s cool seeing a modern take on an old canine character. Next up was my favourite story – Silent Night with Scott Snyder writing and art by Declan Shalvey. We’ve been seeing a lot of Declan lately and he’s got a great style to him. This story is very simple but effective. It’s a serene moment with a hopeful little message and a nice feeling to it. On balance, I think it was a great piece and like I said, it stands as my personal preference. The Harley Quinn story was cool, too. Written by Paul Dini and with Neal Adams handling pencils, ink, and colours, this was a great one, too. There’s something really special about this one, as having Paul Dini, a man who had a hand in creating Harley Quinn, come back and celebrate the character and the recent changes going on with her. So it’s neat seeing that she’s inspiring people to be heroic, and Batman seems to recognize it, too, and I really like the touching little detail of him driving her home over throwing her out of the city or something. Neil Adams does some solid art, too. Batman has a couple of goofy facial expressions, but it’s just fun seeing Batman in an old costume paired off with the modern Harley Quinn, and that really says all that needs to be said about this one. The next story, Stag, by Steve Orlando and with art by Riley Rossmo, wasn’t too bad, either. I’m not a huge fan of the fact that the first three of these stories are sentimental and fun Batman works while this reads more like a preview of future content, but this had enough sincere moments and some solid art that it still sells me on itself and on the whole, yeah, I liked this, too. And then we reach the last story, The Insecurity Diversion. Relatively new writer Scott Bryan Wilson wrote this, and Bilquis Evely did pencils and ink. This one, from what I understand, has been least receptive critically, and I get it. It’s alright. It’s not terrible, but it’s not exactly great, either. I like the new villain Haunter and can see how she could be entertaining, but she and Scarecrow don’t really accomplish much in this story and little else really seems to be going on here other than introducing Haunter. It wasn’t bad, and in reading it through a second time, I did like it a little more and I was entertained by this one, so I don’t want to write things off entirely. I’m glad I read it and would like to see more of this new villain. So there you have it, five stories, and though I liked the first three more than the last two, I pretty much enjoyed all five. Which is rare in an anthology comic – usually there are a couple of good stories and one or two that don’t leave much of an impression, but no, not here. This gets a solid recommendation. It’s a warm comic full of fuzzy feelings. A nice Christmas issue that I’m really glad I got the chance to review. It also leaves me super happy that Batman is in the hands of so much excellent creative talent at the moment. Batman comics have been great since Rebirth and this issue, in my opinion, was no exception. Thanks to the Patron that requested this, as you really made my day. You should check it out for yourself, or hell, if you know somebody who is a Batman fan; this would make a great addition to any gift in the coming holiday season.